New PokerStars 'Fusion' Mixes PLO and Hold'em ... but Why? 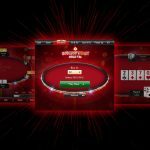 News Home > Online Poker > Can New PokerStars ‘Fusion’ Mix of PLO and Hold’em Recharge Poker Revenue? Can New PokerStars ‘Fusion’ Mix of PLO and Hold’em Recharge Poker Revenue? The biggest poker site in the world has rolled out its latest attempt at innovating and reinvigorating the game. PokerStars introduced a new variant called Fusion Poker this week, which billed as a hybrid between Hold’em and Pot Limit Omaha (PLO). The company has been working on the game since at least this spring, and it finally revealed the details in a blog post this week. It promises to be a dynamic user experience, with the number of cards and subsequent odds changing with every new street. It’s now available to Stars’ international player pool, and US-based players can take part with play money. While PokerStars has yet to release a video detailing the finer points of its Fusion product, several streamers have already taken the new game for a test run. First off, Fusion is played as pot limit game; you’ll have to stick to Hold’em to get your no-limit thrills. It starts out a lot like Hold’em, however, with two hole cards and a dream. The action proceeds exactly as it would in a typical Hold’em game, but if you’re still in the hand when it heads to the flop, you’re then dealt another face-down hole card. Another round of pot-limit betting takes place, and you get a fourth hole card once you hit fourth street. From there, Fusion plays out exactly like a game of PLO — you combine two of your four hole cards with three of the community cards to make your best five-card hand. “We want to give our players games that they have never played before and bring a unique offering to the table,” Severin Rasset, Director of Poker Innovation and Operations, wrote in the blog post. Stakes start as low as $0.02/$0.05 and go as high as $25/$50, although the biggest game running at the time of writing was $1/$2. 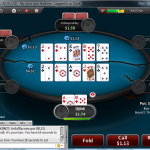 Fusion comes on the heels of a number flops for PokerStars. The company killed off “Unfold Poker” in September after a short and unpopular run. Before that, “Split Hold’em” and “Showtime Hold’em” came and went without stirring the interest of the poker masses. The new game comes when the poker giant is seeing mixed results from their core poker product. The Stars Group released third-quarter earnings this week, and overall, revenues were up 73.6 percent year over year. But that growth has not been powered by Texas hold’em or any of its variants so much as it has been fueled by sports betting. Sports betting accounted for just 5 percent of revenues at this time last year, but that figure surged to 32 percent over this past quarter. Poker is trending in the opposite direction, however. After accounting for 63 percent of total revenues last year, Stars’ poker product represented just 36 percent of profits this year. Overall, total poker revenue is down 3.9 percent. If anyone thinks a new game is going to recharge PS, they might want to re-think their position. PS has more troubles than re-invigorating the games it offers, and they run deeper than a quick fix through a playful cross between Hold’em and Omaha. Players detect PS attitudes that it is too big to fail and that it takes its players for granted – attitudes some do not like. Some say PS no longer offers interesting or good rewards programs, while others point to increased rakes and to Daniel Negreanu who said “more rake is better.” Well, he may think so, and PS profits might bear him out, but players do not share his thoughts. The increased rakes, according to some, are far too high and came in far too fast. They are seen as a money grab and not as part of a strategy by PS to switch its focus from “professional” to “entertainment” players. Site security has become problematic. Players believe PS is far too open to interruptions by hackers and, as a result, it is now less to be trusted as a safe and secure platform upon which to play in games and tournaments. Players also point to “soft play” by members of certain nationalities as signs of on-going online collusion, especially, it is thought, among Russian and Ukrainian players, and they feel cheated by its presence and continuance. Players follow news feeds. They are especially sensitive to allegations of “insider trading” against former Amaya founder and CEO, David Baazow. There is a feeling that “he got away with it,” and that the integrity of PS may have been compromised. Even the purchase of PS, now the Stars Group, by Amaya has resulted in damage. There are suspicions about how Amaya, a company valued at less than $20M, acquired $4B+ in purchasing capital, and that the Stars Group has been newly structured merely as a ploy to enter the USA market. These, along with a general malaise within the poker community about the safety of online poker, are factors PS has to deal with in the near future – the sooner, the better. The concept of the game sounds kinda interesting. At least more interesting as their Unfold game. I would like to try it, but unfortunately they only offer it in a cash game format. I wonder, why they not offer it also in a SNG format. But what I also assume is, that somehow this game includes a higher luck factor again. Yup, you are probably right, Poker Orifice. Just another reason why their star is dimming. Another attempt to kill poker as a “game of skill.” Now in this Omaha, you don’t even show all the pocket cards. Players are forced to play through the streets to get their 4 cards. More money in the bank, more rake for PokerStars. Yes ok PS never stops surprise the online poker community with all these endeavors for quick and profitably moves for the company.More rake! Nothing against the new format, anyone can play whatever he wants with their own money but I don’t want even try it. Also his Online pro Jaime Staples advertised that and guess what he had a very lucrative day at work 🙂 . Nothing personal here with J.Staples I really like his streams!! !